Whether a fish is five lbs. or 500 lbs., Wendell Ko doesn’t see his profits in dollar signs but in blessings. 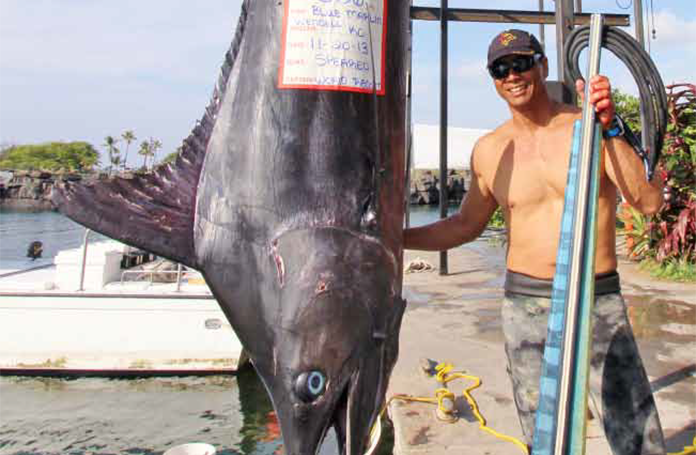 The 53-year-old has been spearfishing in Hawai‘i for more than four decades, but it wasn’t until recently that his wealth came packaged in such behemoth proportions. A big, blue catch Ko recalls the experience from a few years ago, when he and his friends went on their semi-annual Big Island fishing trip. He was awestruck with the giant blue marlin he had just caught. “We were headed back to the harbor, and everyone was trying to guess its weight,” he recounts. “I couldn’t even tell how heavy it was, but I knew it was big. Some were throwing out guesses like, 300 or 400 pounds.” Turns out, “big” was an under-statement, as their estimates were about 100 lbs. shy of the actual weight. The marlin weighed in at 506 lbs., 12-feet long–becoming the world’s biggest fish ever caught with a speargun. He reflected on their day’s fishing adventure, which had began like it always did–with an early morning send off, gliding over glassy waters; it was just him and his closest buddies. This particular day had ended up being especially slow, however, with Ko admitting that they knew they would not be getting anything big that day. The most action they had was earlier that day, when a school of aku swam through the area, but nothing more. to steer the fish away from the boat and himself. 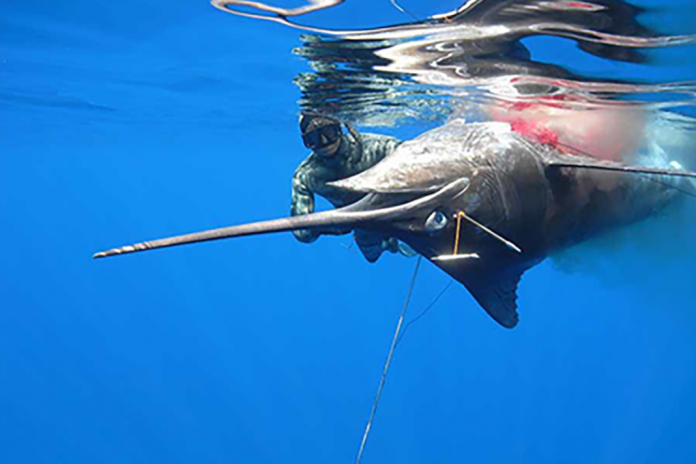 It took a couple more shots from his speargun to subdue the marlin and finally end the fight. Ko never expected such an event, as it was the first time in his life that he ever shot a marlin. Getting hooked on spearfishing Ko grew up surrounded by a family full of spearfishers, so it was only a matter of time before he also took to the sport. 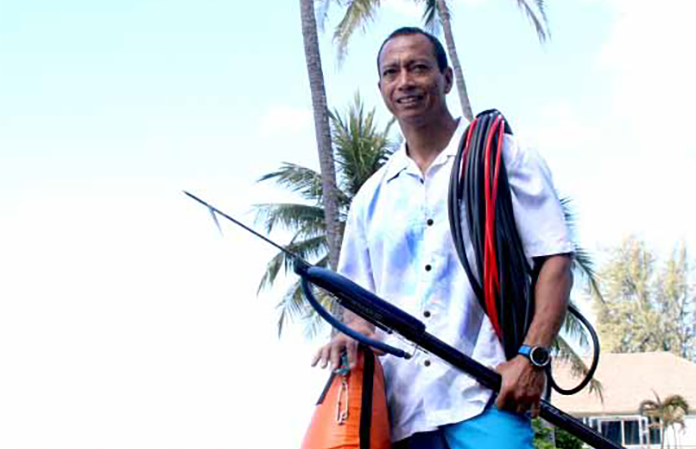 “I used to follow my dad, and we would spearfish with an old Hawaiian sling be-cause back then, we didn’t have spearguns,” he reminisces. 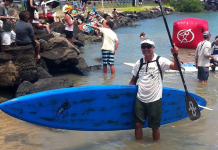 One of his fondest memories is of his uncles taking him spearfishing on the north shore every Sunday, topped off with some Matsumoto’s shave ice. But the most gratifying part of their day, he says, was being able to bring dinner home to the family. Ko gave up reef spearfishing altogether, after noticing a drastic depletion of fish in areas he used to frequent less than five years ago. It is because of this that he mostly sticks to bluewater fishing for pelagic fish, like mahimahi and ono. But even then, he says he rarely takes home a fish; unless the fish presents itself as a good shot, and he knows he can share it with others. A big, yellow catch That is exactly what happened just years prior to the big, blue catch. He and his friends were in Kona, again, taking turns diving down 60 to 80 ft. When it was Ko’s turn to dive down, a school of fish swam by, but instead of shooting a few, he decided it was only right to take one. He ended up taking home the right one that day–a 188-lb. yellowfin tuna. “That fish put up a good fight,” he recalls. “As soon as I shot it, it swam down, so I spent a lot of time trying to pull it toward the surface.” He and his friends had some unexpected company, too. A couple of white-tip sharks circled their catch, but fortunately, they were able to bring the tuna to the surface. Diving partner and friend Nathan Kaneshiro witnessed it all. “You could really see the experience in Wendell in that moment; the way he was able to keep his body calm and how deep he went to get that ahi,” says Kaneshiro, who had just started diving at the time. 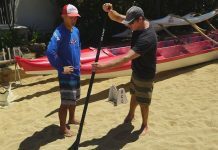 He continued to dive with Ko over the years, getting better at the sport while also gaining more knowledge from Ko about spearfishing and the ocean. Ko takes great pleasure in sharing his knowledge and philosophies. It’s this kind of willingness to help and to be pono to the ocean that has distinguished him as a legend in the spearfishing community. 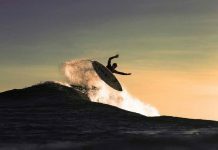 His friends call him patient, skilled and courageous, but most importantly, they say he is someone who stands firm in his beliefs–always respect the ocean because if we treat her right, she will provide bountiful blessings for us to enjoy.